FROM MIDLIFE CRISIS "NOBODY" TO SOCIAL MEDIA "WANNABE"
Jeffrey – he’s over the hill but not over trying to be fabulous. Refusing to be that tree in the woods that no one hears fall, Jeffrey’s life mission becomes harnessing social media and all that entails. He would love to rule the world but until then he sure is going to comment on those who do. Created by Dan Lund, long time animator (Frozen, Beauty and the Beast, Aladdin, Lion King) and indie filmmaker, “Jeffrey: the series” explores the lighter side of the midlife crisis. With punchy animation, smartly written vignettes and all the various social networking platforms feeding the narrative, Jeffrey freely comments on all things pop culture, political and social. If there is a theme in all of Dan Lund’s independent work it’s that he gravitates to the “misfit,” “ugly duckling” or the “delusional charms” of a character’s wants. “I like to find those characters that, despite the rules of the real world, continue to reach for their better self. I think I am good at finding the heart and soul of my subjects through them falling flat on their face. It’s in the moment they get back up that infuses them with charm and keeps me wanting to follow them running down their dream,” says Lund. Lund, having never really met Morgan, approached him and asked if he would mind being used as a jump off point for an animated web series. He told Morgan it was about a middle-aged, flamboyant guy whose midlife crisis was to be in a boy band. Without missing a beat, Morgan said “Honey, I am a boy band!” Lucky for Lund, the real live Jeffrey was a SAG actor and had a history in TV, stage and a flair for writing. A week later, everything to put the show in motion was complete and “Jeffrey: the series” was born. Since then a season’s worth of scripts were written, animated and Morgan voiced his animated alter ego. 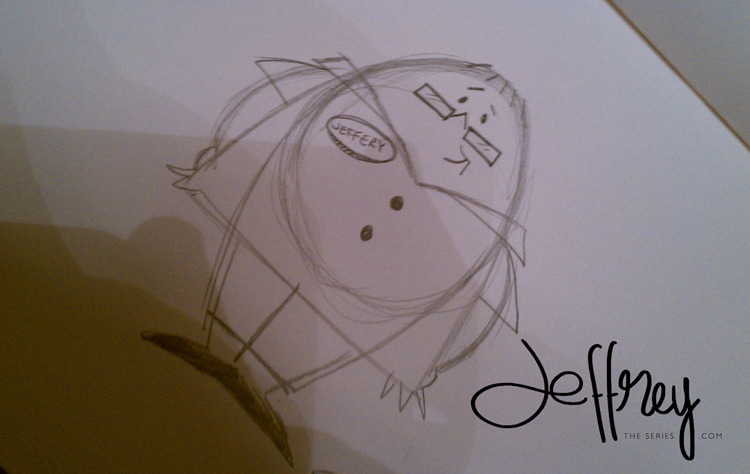 Jeffrey The Series is created by Dan Lund Entries (RSS) and Comments (RSS).